Instruments Taught: Guitar (beginning through advanced), Bass (beginning and intermediate), Piano (beginning and intermediate), Ukulele (beginning and intermediate). Education: Master of Arts degree in Music Theory and Composition, Bachelor of Arts Degree in Music from California State University, East Bay. Musical Projects: Sonic Discharge, DVC Guitar Ensemble, CSU East Bay Singing Society, CSU East Bay Chamber Winds Ensemble, and CSU East Bay New Music Ensemble. Books Used: The Christopher Parkening Method, John Petrucci’s Rock Discipline, Alfred’s Piano & Guitar Methods. Key Teaching Concepts: Developing technique while incorporating music theory and leading into musical interpretation. Michael encourages students to have a disciplined level of skill, while also focusing on playing music with expression. Teaching Days: Thursdays & Saturdays. One of the only instructors on staff with a Music degree in Theory and Composition specifically, Michael Stubblefield’s education and experience allow him to clearly (and of course, patiently) communicate both the basics of music as well as intricate, detailed concepts to students of any age or skill level with an interest to learn and grow as not just instrumentalists, but as well-rounded musicians. In Michael’s constant pursuit for deeper musical knowledge (as well as additional qualifications and certifications), he has recently completed a graduate studies program to earn a Master’s Degree in Music through the highly regarded Music Department at California State University, East Bay. 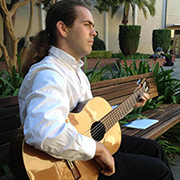 As an undergraduate college student, Michael studied theory and composition with Dr. Jeffrey Miller and classical guitar with Marc Teicholz. At Diablo Valley College, he studied composition with Dr. Owen Lee, guitar with Mark Simons and Rick Flores, Jazz theory and improvisation with Rory Snyder and was enrolled in a variety of piano classes on technique and interpretation. Although he is very focused on his studies, Michael is not just a student and teacher of music, but also a seasoned performer. His performance experience is varied, having been a member of ensembles and groups ranging from jazz combos, to chamber orchestras, to singing ensembles, acoustic guitar groups, and even heavy metal bands! In his years as an instructor at Music Time Academy, Michael has a fantastic track record for working well with some of our youngest beginning students, as well as our many adult beginners.